We love building-wide family programs at my library, especially when they revolve around something pop culture related. With the newest movie in the Jurassic Park franchise about to come out, we had to bring dinosaurs to the library! Attendees can start anywhere in the building and work through the activities at their own place. All they have to do is pick up a "park" map and start the fun! Check out this cool map graphic our librarian Valerie made! The "Visitor's Center" will be on our second floor in the Reference Department. I love getting my adult librarians involved in the family fun. We'll have all of the ingredients on hand for attendees to make their own dinosaur egg, complete with miniature dinosaurs to hatch. A few will be on hand to demonstrate how to hatch the egg using vinegar. The best part about this activity is the price. All you need is some baking soda and food coloring! Tiny dinosaurs are available in bulk at Rhode Island Novelty for super cheap as well, or you might be able to find some at your local dollar store. Another super cheap activity. We'll have pictures of dinosaurs on hand for families to get creative, but all you need is some black construction paper, Elmer's glue, and cottons was. The possibilities are endless! The "Triceratops Enclosure" in the Teen Room will be a couple of low-key activities. I haven't made the stamps quite yet, but I'm probably going to use a pair of cheap flip-flops with a foam footprint glued on the bottom. A couple of big pieces of butcher paper, a little paint, and we've got a fun time discovering what different dinosaur tracks might look like! Sit back, relax, and enjoy the movie that started it all! Free popcorn for attendees too! 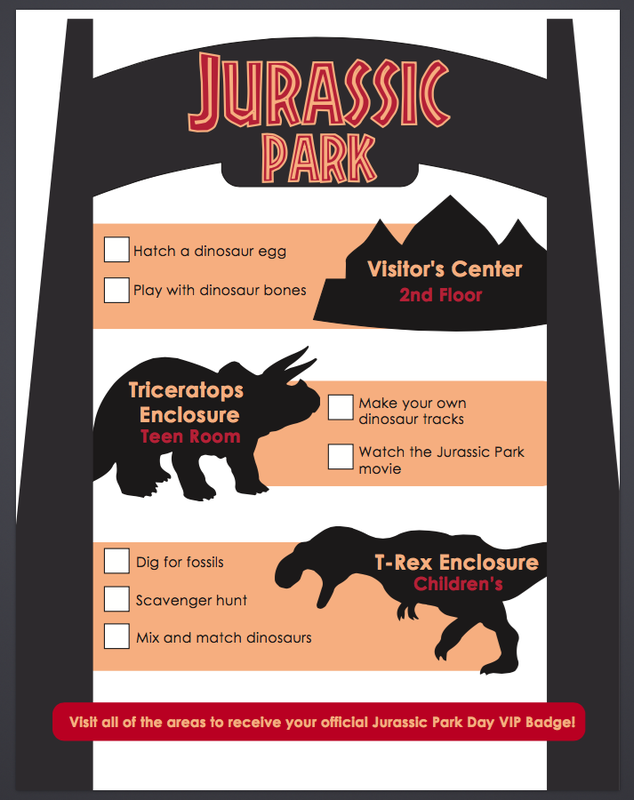 The "T-Rex Enclosure" in the Children's Department will have threats of the fun. 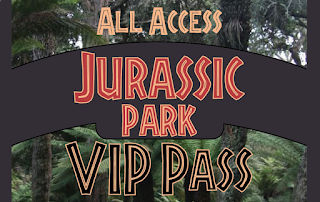 Take a trip throughout Jurassic Park and learn about dinosaurs with a scavenger hunt. A few large cut out bones of a variety of dinosaur skeletons will be a fun game for creating a new breed of dinosaur! 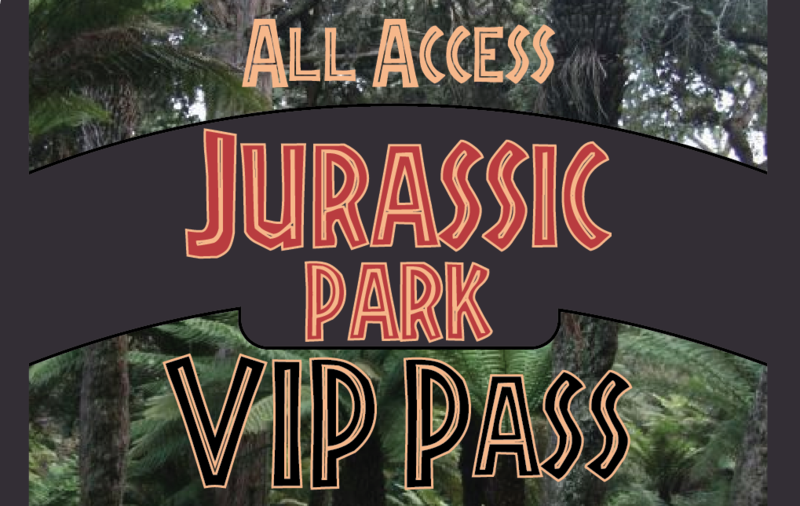 Participants that complete all of the activities will earn a VIP Jurassic Park badge with a fun plastic lanyard to make it look official. It's sure to be a fun day! Are you doing anything special for the new movie release?